Windsor Spitfires forward Joshua Bailey is an example of a player who raised the level of his teams' play by elevating his own overall game. Effort, heart weighs heavily into the evaluation process. I told you I'd be back with another blog, and if you read my first entry, you know that I'll be talking about what it will take for certain players to make that jump into pro hockey, and eventually, the NHL. I'm currently at our annual meetings in Toronto discussing our final lists of the season -- the ones that we'll make public for the teams to use, hopefully, as guidelines for their own drafts -- but I've found some time to put pen to paper for another blog. I hope you enjoy it. The second round of the playoffs begins tonight for the OHL, and there were some surprise upsets in that first round which have played chaos with the matchups. In the East, Barrie, the No. 7 seed, took out the No. 2 seed Brampton Battalion in probably the biggest upset. But in the West, you had a very strong Sarnia Sting team surprise the higher-seeded Windsor Spitfires. In each case, the No. 1 seeds -- in the West it's Kitchener and in the East it's Belleville -- will play the upsets. For those two teams, Windsor and Brampton, it's a tough thing to go out as the favorite with home-ice advantage, but it happens. You look at a team like Windsor, and all they've gone through this season, and you know those kids are disappointed, but you can't help but feel proud of all they accomplished. Those guys, coach Bob Boughner and General Manager Warren Rychel, they have those players playing just like they did when they played -- meaning they compete and they don't quit. Heading down the stretch and into playoffs, their top guys -- Josh Bailey, Greg Nemitz and Bradley Snetsinger -- all elevated their competitiveness, and you could see how that made them a far better hockey club because it trickled down their roster and raised the game of the entire team. You know they'll be back next season with another strong team. When your best players are your hardest workers, that's when you know your team is really competing. Watching the third- and fourth-line guys for a team like Windsor or another team in that division, Sault Ste Marie -- the teams that preach hard work and competitiveness -- makes you begin to wonder just how far they can go in their careers. I mean, generally, if you're a good third-line guy at this level, then that's probably all you can be at the next level, but it's still very difficult, and you have to be a special sort of player to make the jump. That's one of the most important parts of my job: trying to figure out what the player does well, what he brings to the table, and where he would fit in a more competitive league. And that doesn't always mean the top prospects, the top-line players. For example, those third- and fourth-line guys need to be judged on their skills as well. Does he come out and check, and bring that same intensity to every shift, every game, each new season? You look at a guy like Adam Henrique (No. 47 in Central Scouting's midterm rankings) for Windsor. He's not as big as some guys, doesn't have the same offensive flair as others, but he's out there taking every important faceoff and he did a real good job penalty killing this season. Even though he's on the second line, you watch his game and you figure, if this guy makes it, he's going to make it as a checker -- and potentially a very good one. Guys who win big draws, who are valuable on the PK and who play with intensity and bring it every shift, those guys turn out to be very valuable. Hockey teams need all kinds of role players, all kinds of different skills coming together to make a complete team. Take Brad May last season: maybe he doesn't have as much skill as some guys in the NHL, but he competes and he works and you know what? He won the Stanley Cup with the Anaheim Ducks last season. So did George Parros. No matter what you do, if you do it better than 95 percent of the other guys doing your same job, you're going to have a good chance at jumping to the professional ranks and from there, to the NHL. But this is not an easy skill to learn. Sometimes I wonder if competitiveness can even be taught. I'll tell you, a guy I saw more than a few times this season is Josh Bailey (No. 12 midterm) and he's a guy -- kind of like Zach Boychuk in Lethbridge (No. 11) -- who has had problems with being consistent. You hope that's because they're still young, that they will slowly learn that bringing it every night is the most important thing you can do, because these guys -- Bailey and Boychuk -- when they're competing, there's no missing them. They have outstanding offensive instincts. Bailey had 96 points in 67 games this season and Boychuk is a small, skilled forward and has to compete to be effective, but at the CHL Prospect Game, he might have been the best skater out there. And that is a game including the best of the best of this year's draft class. Each of these guys would definitely have to be a top-six type of guy at the next level, and they will be, if they learn that consistency and continue to develop. They have skill, they see the ice very well, they aren't afraid to get into the battles, and they're effective with the puck moving it around on the PP. That competitiveness, though, is what makes all the difference. So what does all that mean? Well for me, when I watch players, I'm almost always thinking, “What can he do at the next level, and will he be able to make the necessary changes in his approach and in his game to get there?” and then, right after, "How does he compete?" It happens every year, some high scorer from the CHL or from Europe gets into the pro ranks and discovers that some of the things he used to do don't work, and instead it's some things he still does better than anyone else that is keeping him up with the pros. So he changes his game, and he stays. 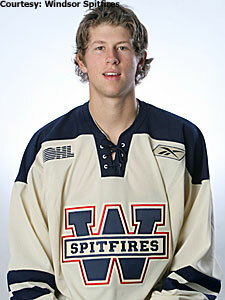 And then, the other side, you have the junior-ranks sniper who still wants to play PP after making the NHL. It doesn't happen, he doesn't change his approach, and he ends up playing men's league hockey in a few years. Take a look at guys like May, Kris Draper, John Madden, Darren McCarty -- all Stanley Cup winners -- and you realize they're valuable guys. And each of them was forced to change his game, to adapt in order to make the NHL. I mean, McCarty scored 55 goals in the OHL his final season. But he made it to the NHL based on his grit, his character, and yes, maybe even his fists. He adapted. That progression is what matters. Guys like McCarty and Madden were top-line guys, but they learned to instead develop those niche abilities that made them valuable and did enough to stick around the NHL for a few seasons. It's difficult, because I'm sure there was a time when McCarty thought he'd score 50 in the NHL and more than a few scouts agreed with him. But if you can really figure what the guy is going to be doing at the next level, then you have him pegged. And that's really how you make up your mind where he sits on your list.